The Trouble With Destiny was a very fun and funny read. I highly enjoyed it! One thing I love about fiction is when authors don't try to make their books anything more than they are. And, at its heart, The Trouble With Destiny is a story about a high school band in danger of being shut down due to budget cuts. The book had a band-camp vibe, which made it even more fun. I was in the band in high school, and it brought back those feelings of community and belonging. Liza is our narrator, and she was a great lead character. 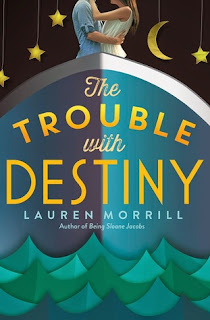 She is the drum major, and is the only band member who knows that the band's future depends on winning the prize money from the cruise ship Destiny. Therefore, she's under tremendous pressure to push the band members to perform at their best during the week-long competition. But Liza goes too far in her zeal to be the best, and the band members start to buck against her authority. She's forced to let go of her tightly held reins, and let the music happen on its own. In the process, she learns a lot about herself and those around her. In addition to this sweet and fun plot, there was an extra sweet romance in the mix. I loved that aspect of the story. And, there was an emphasis on friendship, especially resolving long-held conflicts. I loved that aspect of the story. The Trouble With Destiny was a great read. I recommend it for upper middle grade and all young adult readers.